The Finance Templates and Calculators for Excel are a suite of calculators, tools and Excel templates for performing a wide range of business finance and accounting related analysis. 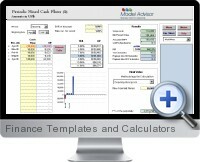 The Finance Templates and Calculators for Excel consist of 73 different financial calculators. These calculators simplify basic financial calculations, saving time and effort in a wide range of evaluations including cash flows, loans, investments, future values, rates of return, financial analyzes and personal finances. Data simply need to be entered as required and the calculators automatically give the results. The Finance Templates and Calculators for Excel have a professional design, are flexible with sensitivity tables and offer charts and help notes to make them easy to use and understand. The sheets can be unprotected to customize the formulas and sheets can be exported to a new workbook for further customization.